When it comes to holiday cooking, home chefs can be roughly divided into two groups: the ones who zestfully approach turkey roasting as an extreme sport and the other ones, looking for their corkscrew and another bottle of wine (and not the cooking wine, either). Both groups are scouring Pinterest and Google for recipes, which makes a blog’s fourth quarter the most wonderful time of the year. To capitalize on this boost in traffic, savvy bloggers step away from the eggnog and come prepared to bring their A-game to end-of-year marketing strategies. Don’t let first-time visitors come and go without an invitation to become long-time fans. Create a special holiday treat to offer site visitors in exchange for their email. Seasonal lead magnet ideas like downloadable holiday gift tags, recipe books, menus, craft projects, and style guides show your guests how special you think they are (and how much you have to offer). Every head chef needs a good way to get organized for Thanksgiving. 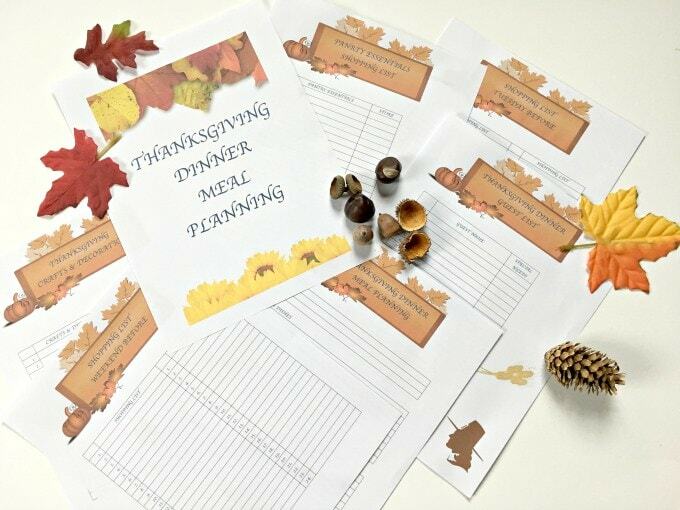 Offering a content upgrade like these Thanksgiving meal plan printables is both really useful for your readers and also a great way to get people on your list. Everybody’s working on their holiday wishlist this time of year, so why not share yours? Most readers are more than happy to be champions for their favorite blogs, but they don’t always think about the value that sharing has to you. Let them know, and many will give you the gift of a shout out. This could be done manually for your blog on your holiday recipes. Alternatively, it’s been requested as a feature for Tasty Pins, so it’s something we’re working on, though we don’t yet have an estimate for when that will be available. The holiday season is the perfect time to experiment with new design elements on your social media sites and your blog. Play around with your color scheme, your photography stylings, and other artistic features to give your online venues a more fun, festive air. Seeing your brand in glittering attire may even inspire you to make a few permanent changes to its appearance and start off the new year with a new style! It can take a while for recipes and crafts to build up search engine cred, so don’t rely entirely on new holiday posts to grab the attention of idea hunters and Google bots. Re-share recipes and crafts from previous years to get them back into circulation and take advantage of the credibility you’ve already built. When I search on Pinterest for “Christmas recipes” two of the top results were published back in 2016! Keep the momentum going with these recipes by making sure they’re optimized for SEO, republishing them on your blog, and re-sharing them on social media. If your old posts are looking a little dusty, polish them up with a new recipe plugin like Tasty Recipes. You can quickly convert all of your existing recipes and make it easier for home chefs to find, read, and share them on platforms like Pinterest. If you’re posting craft projects, Tasty Recipes can do that, too! During the holiday season, a few strategically-placed affiliate links can significantly boost income. Those new visitors will have shopping on the mind, so direct them to your favorite buys using Tasty Links. It makes adding affiliate links a ten second job with years of benefits. Emma from Kids Craft Room does a great job of this with her Frosty Pinecone craft. Each material needed for the craft uses an affiliate link to Amazon. Just one click on these links helps you earn affiliate income for any purchase on Amazon within the cookie window (currently, it’s 4 hours). Since people are doing a lot of online shopping during the holidays, adding these links can be a great way to boost income. And of course, include a list of gifts for you (hint: a well-stocked kitchen or craft room) to help friends, family, and die hard fans fill your stocking! Rebekah from Surviving Toddlerhood published a great gift guide for “crunchy moms.” It’s specific enough to actually be relevant (if you’ve got a crunchy mom in your life) and is chock-full of potential earning income with the affiliate links. At WP Tasty, we develop WordPress plugins that make optimizing food and lifestyle blogs easy. Whether you use our innovative Tasty Links plugin to spread affiliate links across your blog quickly, Tasty Recipes to create beautiful recipe cards, or Tasty Pins to share the love, the results are going to feel a lot like Christmas morning. Hey, bloggers! How are you making the most of Q4 traffic on your blog? Tell us in the comments section!